ASTANA - Europe's and America's policies of multiculturalism, whose aims are democratic, have led to internal integration problems, Kazakh President Nursultan Nazarbayev said. "We see that many countries in Europe and America, conducting formal policies of multiculturalism for democratic ends, have come up against problems. It's turned out that internal integration is proceeding slowly or has come to a standstill," Nazarbayev said at the 26th session of the Assembly of the People of Kazakhstan in Astana on Saturday. "The question arises: what's going to happen in the world in the future, where do multiethnic trends lead? I am sure that we are following the right path and that everyone will study it. I am also sure that developed countries, which have ample political experience, will find a solution to their problems," he said. 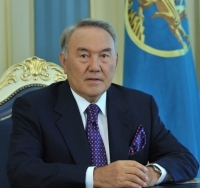 Nazarbayev said that the correctness of Kazakhstan's domestic strategy is confirmed by the global ethnic situation. "We have never divided our country's citizens in this respect. All these years I insisted on pursuing a single, consolidating policy for the whole of society, for all citizens and ethnic groups without exception. I want to emphasize that we have all the legal leverage to follow our Constitution, where all these issues are spelled out," the president said.